The cookbook that started it all - the 1976 edition of the Betty Crocker Cooky Cookbook! 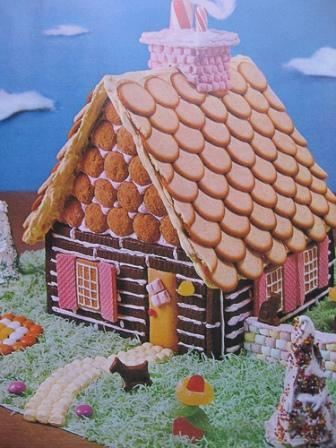 As a child Loreta Wilson spent hours staring at the cooky house (pg 64-65), with dreams of some day making this cooky house. In the late 1970’s, Loreta and her older sister Louise spent their summer drawing floor plans of their dream house, and driving around town in search of open-house signs. The next summer, returning home from college Louise helped Loreta advance from simply drawing floor plans, to now building their dream house using artist-posterboard. Their mutual love of architecture was developing quickly. In December 1980, with the help of a magazine article, Loreta built her first gingerbread house. The gingerbread pieces stuck to the cookie sheet and the frosting-glue was a globby mess. After that disaster she vowed to NEVER build another gingerbread house again! In the early 1980’s Loreta enrolled in a high-school drafting class, and Louise bought Loreta her first full-fledged drafting kit. Her passion for drawing and ability to dissect an object in her mind flourished. Several years later, Loreta’s mom baked and constructed a couple of gingerbread houses and invited Loreta and her younger sister Nola to decorate them. Grudgingly Loreta accepted the invitation, and now several years after her first disastrous attempt, Loreta decorated her second gingerbread house.... and this time the gingerbread Architect inside her came alive. As she decorated her gingerbread house, she was already planning for the next year… with windows and lights! She was hooked! And yes, the next year windows and lights were added! After spending a few years figuring out how to successfully build a gingerbread house, and more importantly WHAT NOT TO DO, Loreta decided to develop a Gingerbread website to share her gingerbread knowledge, and passion for architecture, with the world. Louise continued to support Loreta’s growing passion, purchasing every book on gingerbread she could find, helping Loreta to combine the world of gingerbread and architecture. In December 1999 the gingerbread website went live - A site to encourage beginners and inspire the advanced. Gingerbread templates were developed, and recipes and pictures were shared with the world. Summer of 2001 brought family tragedy when Louise was diagnosed with a rare form of Leukemia. Loreta was the match and became the stem-cell donor to help her sister fight this awful disease. Two years later Louise lost the battle. Loreta was devastated and as a result, over the next couple of years, the gingerbread website fell by the wayside as Loreta dealt with her loss. A few years later Loreta picked up the pieces, unburied her passion for gingerbread and architecture, and once again re-built her gingerbread website. Today Loreta now devotes 100% of her time to gingerbread- creating gingerbread house templates, building and decorating gingerbread houses, and maintaining the gingerbread forum and website continues to be Loreta’s passion, representing her love of gingerbread and architecture. Every gingerbread house template that Loreta designs represents a small remembrance, and dedication, to her sister Louise. A big thank you from myself and all the wonderful members of this site!